Growers we like near Portland. A boutique grower with a consistent handful of strains, its impressive Kosher Kush, Cherry Kush and Bruce Banner have brought it renown among the top organic growers in the area. The buds are expertly cured, always going down smooth and leaving you with a long-lasting, euphoric high. Available at many dispensaries in the area, including Pure Green, Rose City Wellness and Divine Kind. After making its mark with a stellar Jack Herer, Small Axe Farms has expanded and rebranded itself as Ten Four, still available at Pure Green, among others. It also grows a notable Platinum Cut Girl Scout Cookies, which is one of those strains that show OG connections and credibility when grown right. Its indoor operations have expanded, adding favorites like Blue Dream and the White to the lineup. William Simpson's Chalice Farms is quickly establishing itself as a premium grower that spares no expense in creating fine flower—with a proprietary curing method and beautiful farms that cause others in the industry to sound as if they've been to Beulah and back when describing them. The operation is also every bit as vertically integrated as a high-fashion line—it sell its flower at a growing number of stores in Portland, Tigard and Dundee, and is remarkably transparent about the test results of the 30 strains on its website. This farm arguably grows some of the most scientifically perfect and pure buds, available at Farma, which this year was voted the best dispensary in Portland by WW readers. Renowned grower and advocate Jeremy Plumb and the rest of the Farma team reject the limiting binary of indica versus sativa, and have developed their own way of classifying strain effects and terpene profiles. Our latest favorite is Tyra Banks, a cross between Space Queen and Obama Kush. Part of the Oregon's Finest crew, this farm has gained a following for its high-quality, organically grown nugs and generous giveaways since marijuana was legalized in Oregon. Its Space Candy will turn around the shittiest of Mondays, and we love the pure sativa Grapefruit for a refreshing, uplifting buzz before a workday. Run by Women Grow co-founder Sara Batterby, HiFi Farms has garnered a reputation as a holistic cannabis company, representing sustainable growing practices, organic materials, community events and music. Known best for its Island Sweet Skunk strain, look to this women-led group to spearhead normalization of the cannabis industry. Rafael Martinez Jr. has a small grow site in downtown Portland and a larger farm in Southern Oregon. His products sometimes make it into dispensaries, but only if patients bring them themselves. Martinez doesn't yet have a commercial license but plans to apply for a recreational permit next year. While small now, Martinez—son of Madeline Martinez, matriarch of the World Famous Cannabis Cafe—has a leg up in the industry thanks to his parents' tutelage. Look for him to lead a trend of boutique urban pot farms later next year. William Green's quarters, sealed in glass jars with his silver signature, retail for $90. His Starkiller OG won gold at the 2014 Cannabis Cup, and his CBD-heavy Nubian earned silver, both major upsets for a guy growing 3 to 4 pounds per harvest. Both strains are great, but they don't stick around long. While recreational users might long for better selection of strains at first, we can see them coming around to limited releases like these before too long. Jamie makes a Lean Back Sizurp so smooth it disappears into soda. Known for a purported deep connection with earth and plants, Jamie and his team view cannabis as a holistic life enhancer, not just a high. This longtime grower has been raided, arrested and shut down previously, so don't expect Dirty Arm Farm to fade as the market grows, but do try its Green Crack live resin next time it's available. 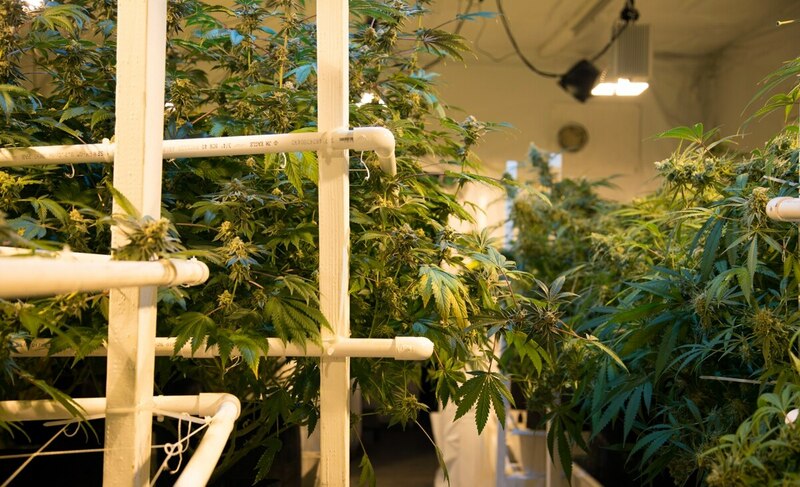 Owner Jesse grew up in the industry, coming home from the hospital to his parents' trailer in Canby with 5 kilos of cannabis hidden under his crib. With current farms running on 100 percent wind energy and plans to consolidate them into the first carbon-neutral garden in the state in one location, Eco Firma has come full circle with its latest site in Jesse's hometown. Look out for special Blackberry Ice Cream and Voodoo Child strains geared toward rec consumers who've yet to build up a tolerance. While its flower isn't much available in local dispensaries yet, just about everything else from branded hard candies to small jars of personal lubricant in logoed bottles are everywhere around town. Known for its cancer-fighting RSO, Genesis is the gentle, local lifestyle brand everyone with an SUV needs. If you do see its Kush, grab it and make an OMMP card holder your best friend if you want the good stuff. Founder Geek Mike was introduced to cannabis by his in-laws, who recommended it to combat post-traumatic stress disorder. Fed up with inconsistent supply, Mike tried and tried again to grow high-CBD, medical-focused cannabis organically—one day, his friends noticed, they started taking pictures, and it's been nonstop since then. Strains Dr. Who, Querkle, and old-school Headband are standouts, though his Pennywise is noticeably better than competitors' attempts.